Summary: This game that will blow your stress away! Angry baba.Become a barbarian today and blow your enemies away.Angry BaBa with an exciting sensation of hitting the targets! In the mood to take down your enemies? You should be playing the entertaining and fun Angry BaBa: Hit and Far Away game on your phone. This app lets you hit at pesky targets until you’ve completely blown your enemies away. You’ll be able to improve your gaming skills and achieve high scores every time you beat a round. With this game, you can erase boredom and vanquish your enemies at the same time! 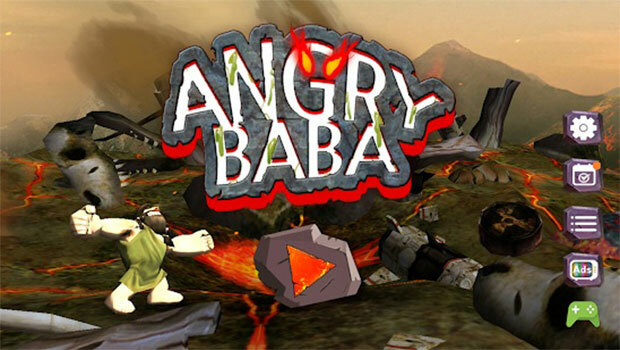 Your first step should be to download the Angry BaBa: Hit and Far Away app from either the iTunes Store or Google Play. It’s free to download, and there aren’t any steps you need to do to get started. Your goal is to use your avatar (which can be a Giant, Zombie, Golem, Santa, or Robot) to hit the targets that pop up on your screen. You’ll get more points the farther it goes. The flying objects that appear can be anything from meteors and missiles to space worms and UFOs. Any time the target hits another object (such as a pelican, space turtle, or space stingray), rubies will rain down and give you bonus points. With each round, you’ll see your score grow and your enemies ground to dust. The Angry BaBa: Hit and Far Away game is perfect for helping you let off some aggression. Just tap the screen to hit your target, and your enemy will be destroyed (along with any tension you might be holding onto!). The game, designed by Game day Inc., is dynamic and exciting with colorful 3D graphics and sound effects that will draw you into the action. Plus, you can challenge yourself to beat your high score each time you play. You’ll quickly see an improvement with your skills – and your confidence in taking out your enemies will grow! There are a few elements to the game that can be a little frustrating. For example, you do have to pay for some in-app purchases. It can feel disappointing when you first start playing to realize you have to shell out some money to access all of the levels and points. Also, the Angry BaBa: Hit and Far Away app has lots of ads. There are banner ads at the bottom of your screen while you game, and video ads that appear before you can advance to the next round. If these types of ads are distracting to you, the game can become less fun to play. However, once you play for a little while, it’s likely you won’t notice the ads as much as you focus on hitting your targets. Blasting away your enemies can become a great pastime if you download the Angry BaBa: Hit and Far Away game today!